Yamaha has upgraded its popular MG series mixers with six new models. 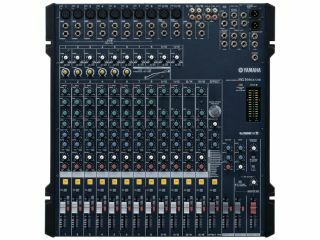 Yamaha´s main aim is to simplify and enhance live recording. One of the most useful upgrades here is the introduction of 'single-knob' input compressors, originally found on Yamaha´s EMX line of powered mixers. All six new MG models offer the ability to dial in the right amount of compression by turning a single knob. As you can probably tell from the model suffix, three of the new mixers (MG16/6CX-USB, MG166C-USB and MG206C-USB) include a USB port as well as a copy of Steinberg Cubase AI4. The new MG166C and MG206C mixers feature Neutrik XLR connectors, redesigned faders and LED metering that is legible even in daylight. They also include semi-parametric EQ and advanced circuit design. To finish off, the MG166CX incorporates Yamaha's digital SPX multi-effect processor. Prices are as follows: MG166C ($449), MG166CX ($499), MG166C-USB ($529), MG166CX-USB ($599), MG206C ($729) and the MG206C-USB ($799). All models are shipping now, see Yamaha for more information.